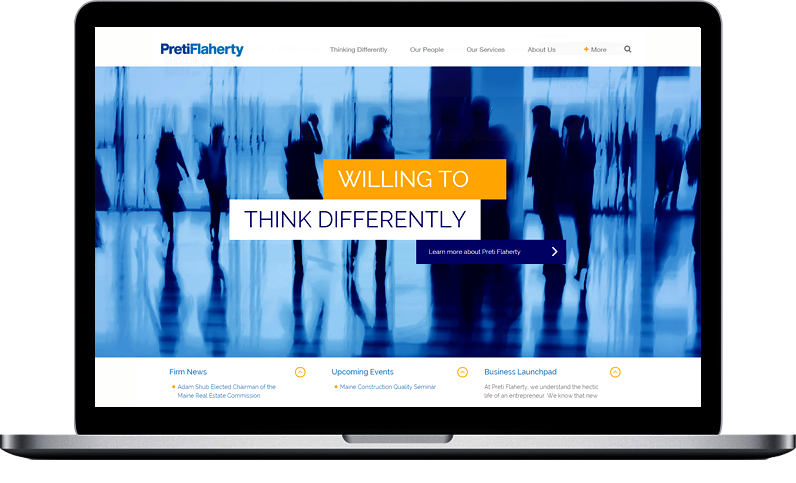 Preti Flaherty, a New England powerhouse firm that employs more than 100 attorneys, launched its new website today. The firm is known for its willingness to “Think Differently.” The website’s design, page structure, navigation and text were carefully crafted to reinforce this topline message. The website was designed and developed by Great Jakes through a collaborative process with Preti Flaherty's business development team and was built with Great Jakes’ unique Rainmaker CMS technology. The technology includes "Attorney Microsites" – functionality that Great Jakes pioneered that provides each of the firm's attorneys with small, highly customizable websites. Attorney microsites essentially are small websites for each attorney that fit within the firm’s larger website. Information-rich attorney microsites will help Preti Flaherty attorneys demonstrate their particular expertise. An attorney's microsite could be configured to display podcasts, video, PowerPoint presentations, and twitter and blog feeds, as well as "custom pages" to highlight a specific aspect of an attorney's practice. Unique elements of the website include an infographic-driven About Us page with client stories that illustrate the firm's “Thinking Differently” approach. The site also features Facebook-style predictive search, which makes it easy for users to quickly find the information they are looking for on the website.